Today started like any other here; breakfast and then waiting outside the Guest House straining to catch the first glimpse of the yellow GNCEM bus. Unfortunately all of the buses here are yellow so it can be quite a challenge. Bhagobanpur is on the other side of a lake from Daspara School and we could see Daspara’s yellow building as we walked along the side of the lake. 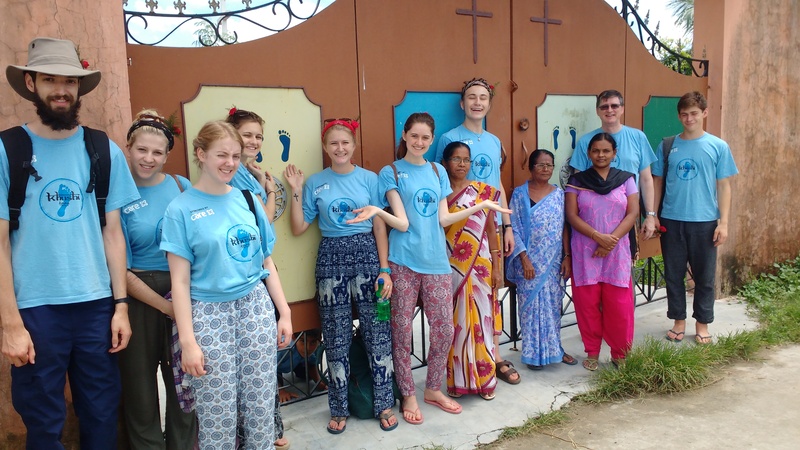 Bhagobanpur has been supported by Khushi Feet; we supplied the money for their boundary wall which is brightly coloured and decorated with Khushi’s blue footprints. The wall keeps the children safe and allows the school to keep goats which were the first thing we saw upon entering. We are now used to the scenario of going to the main hall, being sung to and then singing to the children. Despite the fact that they probably do the same thing every time they are visited and we have done the same thing for two weeks it is still rewarding to see their faces light up. That may have been helped by the stickers and sweets we gave them. And then we were off, a flying visit as we were trying to get to the Gangajoara School before the children went home. Despite the best efforts of the driver we were stuck in a traffic jam in a market. The bus inched past stalls laden with colourful fruits and vegetables before finally being released back to a normal speed. Gangajour is a little more remote and accessed by a dirt track that the bus couldn’t navigate so we walked along a brick path in the mud to a school very much still under construction. There are only 3 classes there at the moment but the intention is to grow with every year until there are 10 classes. This time a quick song from them and us before the children had to go home in the heat. Khushi Feet has supplied the funding for the ground floor windows, doors and floor tiles here and while only a small thing, this has helped them tremendously. It’s very encouraging to see first-hand how Khushi fundraising is actually making a difference. Both schools are surrounded by a very pleasant amount of green fields, quite waterlogged with the monsoon but a visual break from the greys and dirt of the city. There are many more cows out in the rural areas and one even waded across to us, to the accompaniment of the humming of the Jaws theme. Back on the bus again and off. Subir and Eunok (founders of GNCEM) kindly treated us to Chinese for lunch at a nearby mall food court, much less grand than the mall we had seen last week but still a world away from the streets it is surrounded by. One more bus journey back to the guest house for a much needed rest. Things I have learned today: Do not sit on the wheel arch of an Indian bus; bumps in the road lift you out of your seat and painfully back down. Napping on a bus isn’t advisable either. Also the lovely green fields hide cobras, picnic at your peril!